Frances Leggroan was baptized as a child, becoming a third generation Mormon on her father’s side of the family and a fourth generation Mormon on her mother’s. In fact, she was the great-granddaughter of Jane Elizabeth Manning James, an 1847 pioneer into the Salt Lake Valley. Her father, Louis Leggroan, and her mother, Nettie James Leggroan, lived near Milo, Idaho, when she was born in 1906. 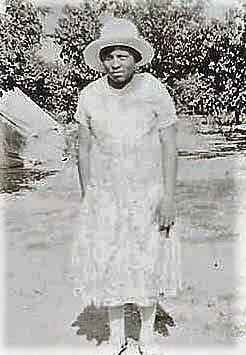 Her mother, Nettie, died when she was only five years old, leaving behind Frances and her sister, Thelma. Her father soon remarried and Alice Weaver Leggroan became her step-mother. Frances and Alice must have had a close relationship as Frances referred to Alice as “mother” when she spoke of her. By 1910, Louis Leggroan had moved his family from Idaho to Mill Creek, Utah. It was there, in the Wilford Ward, when Frances was eight years old that she was baptized. Her family’s long history in the LDS Church did not stop the prejudice and hurt she experienced growing up among white Mormons who treated her as if she were a second class member. “I was taught you can’t go into the temple, you’re not the right color. You’re not good enough. And then when they had the revelation, it was: ‘Come, let’s go [to the temple].’ I told them, I didn’t change my spots that easy. And I had scars even though they weren’t where they could see them. I still had them. And to this day I still have my spots, because I can’t forgive and forget like you’re supposed to. I was hurt too badly.” Her encounters with narrow-minded, bigoted Mormons and the wounds they inflicted, however, did not stop Frances from remaining a member of the LDS Church until she died. Frances grew up on a six acre farm in Mill Creek. At that time Mill Creek was a rural area of the Salt Lake Valley, about eight miles southeast from downtown Salt Lake City. She described her family’s primitive living conditions and how remote Mill Creek felt in her childhood. Her father Louis raised his family in “a frame house. Three rooms. No running water. No lights. Coal stove.” The Leggroans were quite self-sustaining, despite the circumstances: “We grew everything we needed to eat. We had chicken[s], rabbits, and pigs. We had a couple of geese,” Frances recalled. The family had no need to go downtown for food, only for supplies which they could not raise on the farm. When asked if life was hard, her answer was yes. Frances’s schoolmates teased and taunted her. Their actions told her, “You’re not as good as I am. You’re a different color.” The boys were relentless, pulling hair, calling names, making fun of her in any way they could. Frances “fought all the way through high school.” Her father gave her an umbrella when she began Granite High and told her to use it to defend herself. After that, she carried it with her, rain or shine. As a result, she tried to limit her interaction with white people to school and church. As a young woman Frances worked as a domestic in private homes before taking a job running the freight elevator at the Newhouse Hotel in Salt Lake. When she became pregnant with her first daughter, she knew her boss would dismiss her as soon as he learned of her condition. Pregnant women did not work in his hotel! Later, she and Monroe found work at Hotel Utah. Monroe had heard about the LDS Church while still in the South but his work as a hotel waiter brought him into close contact with Mormon missionaries and LDS General Authorities. In 1935, Monroe converted to the LDS Church. Despite his wife’s frustrations with LDS racial policies and the treatment she had received growing up, the couple decided that they could do more good and effect change from inside the faith rather than from outside. As Frances put it, “You could say things and ask questions when you’re inside. Her longtime membership in the Church influenced Monroe’s decision to join. “That’s where I was. See, I was raised in the Mormon Church,” Frances stated. After he converted, Monroe became a powerful ally of black men in the LDS Church. Frances died in 1997, at the age of 91. She lies next to her husband and other relatives in Elysian Burial Gardens in Mill Creek, Utah. Church of Jesus Christ of Latter-day Saints. Record of Members Collection. Wilford Ward, Part 2. CR 375 8, box 7641, folder 1, image 200. Church History Library, Salt Lake City, Utah. Fleming, Frances [Leggroan]. Oral interview by Leslie Kellen. Salt Lake City, Utah, 1983. Transcript. “Interviews with Blacks in Utah, 1982-1988.” Ms0453. Special Collections. J. Willard Marriott Library, University of Utah, Salt Lake City. "Fleming." Presiding Bishopric stake census, 1940. CR 4 313. Church History Library, Church of Jesus Christ of Latter-day Saints, Salt Lake City, Utah. "Fleming." Presiding Bishopric stake and mission census, 1950-1960, 1962. CR 4 316. Church History Library, Church of Jesus Christ of Latter-day Saints, Salt Lake City, Utah. Utah. County Marriages, 1887-1937. Monroe Fleming and Frances Leggroan, 15 March 1930. Microfilm 429136. Family History Library, Church of Jesus Christ of Latter-day Saints, Salt Lake City, Utah. United States. 1930 Census. Utah, Salt Lake County, Salt Lake City. Frances [Leggroan] Fleming, oral interview by Leslie Kellen, Salt Lake City, Utah,1983, transcript, 83, “Interviews with Blacks in Utah, 1982-1988,” Ms 0453, Special Collections, J. Willard Marriott Library, University of Utah, Salt Lake City. The material in this biography is taken from this interview unless otherwise noted. Church of Jesus Christ of Latter-day Saints, Record of Members Collection, Wilford Ward, Part 2, CR 375 8, box 7641, folder 1, image 200, Church History Library, Salt Lake City, Utah. Frances Leggroan Fleming, Find A Grave.com.